Okay, it’s only Christmas Eve, but I’ve been itching to make a post since I haven’t made one in, like, a decade. This holiday has been hardly a holiday. I’ve been either stuck at home babysitting my brother or dragged outside into the cold to do Christmas shopping in the rain. To think that Christmas is only in a couple of hours and I haven’t really had any time to myself. The only time I’ve had to myself was when I was sleeping. Seriously. I’ve been waking up as late as possible everyday until my back starts to ache and stomach starts grumbling. But I don’t even feel hungry during the holidays. Today I had hot chocolate and mini yumyums for breakfast and McDonalds for dinner. No lunch. I didn’t even feel hungry, but I wanted to eat anyway to get my mind off shopping. And now that I’ve started ranting, I’d like to add this: Whenever holidays approach, I become ill. Almost 100% of the time. It’s not even funny. Something always happens. On the last day of school this term, I caught a cold when my school’s concert choir had to sing in front of ks4. I was right at the front with snot dripping from my nose like drops of water from a tap. I didn’t have any tissue. Best day to forget my tissue… Luckily, I was on the bus with Phoenix that day and she gave me a tissue. How kind. I mean it. I’m not being sarcastic or anything. I honestly felt like crying. But I didn’t. Funny how we were on the bus together on the last day of a term on the upper deck. Just like the last day of school last school year. I don’t know if that’s funny or scary. My cold or whatever seemed to get better until I went out again with my mum and sister to buy chocolates for friends and family.My eyes were itchy, my nose was running (but at least I came prepared!!) and I just happened to run into someone in my school. I didn’t even recognise her at first and I’m not sure if it was due to my poor eyesight, her strange new cool hairstyle that she didn’t have that morning or my disorientation. Well, whatever it was, I was still embarrassed when I stared right at her, wondering if it was her, deciding it wasn’t and then finding her saying hi to me the next minute. So embarrassing. Plus, I was walking around aimlessly with a pack of doughnuts in my hand. It made me feel so fat, but I couldn’t leave them behind. I love doughnuts. If I ever become fat, it will be Asda’s fault. Also, this holiday, I have already been injured twice (or thrice, I’m not counting): when my little brother took a spoon and tried to ‘feed’ me and ended up jabbing me in the gum. I was bleeding. The other time was when I was running upstairs. I skipped two stairs and banged my toe. My nail ripped and I was rolling around on the floor, squealing in pain. But what has any of this got to do with Christmas? 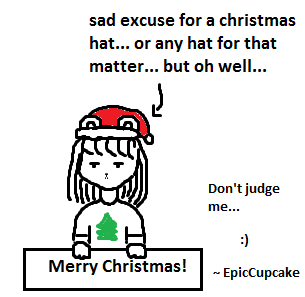 I really should just stop ranting about my not-very-christmas-y holiday and start making it better and baking cupcakes. That’ll make me feel better. Merry Christmas! Hope you have a wonderful day full of eating, opening presents and procrastinating! This entry was posted in Uncategorized and tagged Christmas, coal, FujoshiPeanut, help me, holiday, Merry Christmas, MyNameIsEpicCupcake, presents, shopping, tired.